Have you ever wondered what you would catch if you could cast your fishing line 500 to 1000 metres offshore? Here at Paul's Fishing Kites we know from the thousands of reports sent in from our customers around New Zealand and overseas. Whether you intend fishing from shore or boat, wish to troll for gamefish from the shore, bottom fish or simply cast your line out until your fishing reel runs out of line we have the perfect kite system for you. Our range of kites can get you fishing two or three hooks on as little as 8kg mainline from small rod and reel right up to big 100kg kitefishing rigs which can tow 25 hooks or more out up to 2 kilometres offshore. 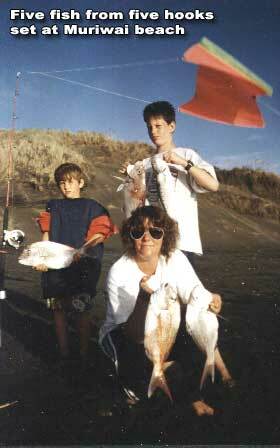 When Paul's Fishing Kites released its first kite fishing system in 1987 it was a revelation! Shore-based anglers instantly acknowledged that a wind driven system had finally been devised that could overcome the frustration of casting fishing lines well past surf and shallow water out to where the big fish are. 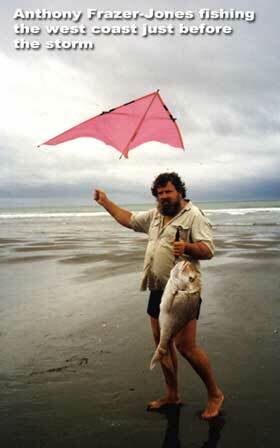 Kitefishing allows fishers to productively fish in much lighter winds than any other wind driven fishing system. Paul's Fishing Kites are dedicated to improving their products to enhance your fishing enjoyment and success. As a direct result of our earnest commitment to quality, performance and versatility in kite fishing technology, and as research and market leaders in this innovative industry we have developed a variety of systems to facilitate shore based fishing in terrain and conditions otherwise impossible to access or fish using any other method. Our light wind "power chute" kites can fish in as little as three to four knots of wind. Our heavy wind "super kites" have been used for towing scientific depth sounding transducers off the Ross ice shelf in Antartica. One of our customers, Alan Radcliff fished a strong wind kite in winds gusting over 80 knots as recorded by the lighthouse keeper at Manukau Heads. Check out our online store to purchase any of our products. Or see the catch reports to see how productive the fishing gear is.